CLEARANCE DELIVERY PROVIDED BY CHICAGO APCH CTL (C90) ON FREQ 124.7 OR 847-289-0926 WHEN CHICAGO EXECUTIVE ARPT (PWK) ATCT IS CLSD. CHICAGO APCH (C90) PRVDD'S CD THIS FREQ OR 847-289-0926 WHEN PWK TWR CLSD. Page Engelke & Assoc., Inc.
A110-11 NOISE SENSITIVE AREA N AND S OF ARPT. A110-14 CONDS NOT RPRTD; MON FM 0000-0700, MON THRU FRI BTWN 1530-0700, FRI BTWN 1530-0700 ON MON. CONDS NOT RPRTD SAT AND SUN ALL DAY. A110-16 AREA 3 CLSD PERMLY. A110-19 NOISE ABATEMENT PROCS: WHEN HLDG RWY 16 HOLD PAD; ALIGN ACFT AT 315 DEG. FOR RWY 34 PAD ALIGN ACFT AT 190 DEG WHILE WAITING TKOF. A110-22 NO TURBINE ENG RUNS BTWN 2200L AND 0700L ALL WEEK. A110-23 NO EDGE LGTS ON TWY F, P, Q, T - REFLECTORS ONLY. A110-24 AREA 2 AND 3 TENANT PRKG ONLY. TSNT ACFT MUST SEEK ACCOMMODATION AT AN FBO. A110-25 ACFT TRANSVERSING NE HNGRS, ENTER ON QUEBEC, EXIT ON PAPA. A110-26 HOT SPOT 1: NO RWY GUARD LGTS AT THIS LOCATION. A110-27 NMRS CRANES INVOF ARPT. A110-4 COYOTES, BIRDS, MIGRATORY BIRDS, SKUNKS AND OTR WILDLIFE ON AND INVOF ARPT. PYROTECHNICS IN USE FOR BIRD CTL. A43-16 RWY 16 PAPI UNUSBL BYD 8 DEG LEFT & 9 DEG RIGHT OF CNTRLN. A43-34 RWY 34 PAPI UNUSBL BYD 8 DEG LEFT & RIGHT OF CNTRLN. A49-16 RLLS NSTD DUE TO SPACING. A57-06 RWY 06 APCH RATIO 22:1 AT DSPLCD THLD. A57-12 RY 12 APCH RATIO IS 20:1 AT DSPLCD THLD. A57-24 RY 24 APCH RATIO 20:1 AT DSPLCD THLD. A57-30 RY 30 APCH RATIO IS 21:1 AT DSPLCD THLD. A58-12 RWY 12 15 FT ROAD & 6 FT FENCE. A58-24 RY 24 14 FT ROAD AND + 40 FT TREES 150 FT & 50 FT L 6 FT FENCE. A58-30 RY 30 +6 FT FENCE 0 FT FM THLD +20 FT TREES 0 FT AND 50 FT FM THLD & 15 FT ROAD. 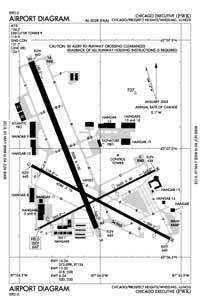 A81-APT ACTVT REIL RWY 16, 34; HIRL RWY 16/34; MIRL RWY 06/24, RWY 12/30; RLLS LGTS RWY 16 - CTAF. E111 ARPT ESTD PRIOR TO 1959. NO OBJECTION FOR ASP ON RWYS 12L/30R & 16/34 ONLY. E60-16 ENGINEERED MATERIALS ARRESTING SYSTEM (EMAS) RY 16 DEP END: 242.97 FT IN LENGTH BY 170.10 FT IN WIDTH, SETBACK 35 FT FROM RY END. E60-34 ENGINEERED MATERIALS ARRESTING SYSTEM (EMAS) RY 34 DEP END: 230.82 FT IN LENGTH BY 170.10 FT IN WIDTH, SETBACK 304.18 FT FROM RY END. E80A US CUST USER FEE ARPT. FOR CUST CLNC 2 HR MIN ADVN NOTICE RQRD MON-FRI 1100-1900. CTC CUST AT 847-894-7292.